Peahens can add an exotic element to your property but you need to be prepared to care for them before you bring them home. A safe place to roost is an essential part of your peahens living environment, regardless of whether the hens live outside or within the confines of a coop. Your peahen's natural instinct is to search for a safe place to roost every night as darkness approaches. If your peahens are left to their own devices, most will choose to roost in a very high location such as on top of a building or in the high branches of a tree. These are safe locations that keep the peahens well out of the range of most predators but high roosting locations also make it difficult to contain or capture your peahens. 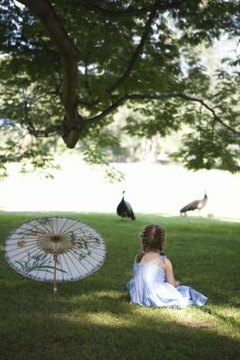 Since peafowl are inclined to wander, you may lose peahens who roost on neighboring properties or whose nightly roosting habits take them farther from home. Before you build your peahens a roost, you will need to choose a location. If your hens are still fairly young, you will have better luck training them to accept the roosting location of your choice. If your hens are older and consistently roost in one location, you may have to build your roost in the location that the hens prefer or risk it going unused. Of course, if your peahens are kept in a coop and do not have free range or outdoor time, build the roost in an appropriate location within the coop. Your roost should consist of a length of wood that is positioned at least 3 to 4 feet off the ground. The post or beam that makes up the roosting area should be a couple of inches wide so that the peahens feet can grip the roost easily without risk of falling. A 2-by-4-inch wooden board is a good choice for building a peahen roost. The roost can be held up with a board on each side or attached to the walls of your coop, depending on your preference. You should build an individual roost for every bird you own to allow plenty of space for each bird. If you plan to have more than one bird use each roost, you need to make sure the roost is wide enough that both birds have several feet of room on either side of them so that they can maneuver and turn around while using the roost. Do not use painted wood for roosts or wood that contains chemicals that could harm your bird. Make sure your roost is in a location you can hose down and clean off or your roosting area will begin to smell strongly of peahen feces.